2015 marks the 1250th anniversary of the grant of land by Osmund, King of the South Saxons, in AD 765, “for the building of a monastery” in Ferring. A second charter, in AD 791, was for a grant of woodland to “the church of Saint Andrew, which is situated in the land which is called Ferring” – proof that the church had already been built by this time. 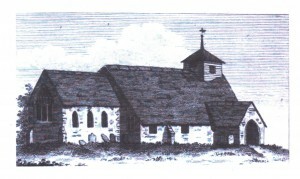 The original church would have been made of wood, but by the early 12th century it had been rebuilt in stone. St Andrew’s was enlarged over the next century, and by AD 1250 became the size and shape that we know it today. The year 1250 is also the earliest known date of any of the St Andrew’s clergy, who is named simply as “Simon”. A proper listing did not begin until 1403 with William Blunteshaw, the first of almost forty clergymen who have served in the village since then. But it was to be another century and a half until any of the names of the people of Ferring who used the church were recorded. Because of these strict orders, the St Andrew’s clergy began keeping parish records in 1558. The first name on the baptismal register, on 10th April, is that of Thomas Andrewes, who was named after his father. Young Thomas did not live very long, because he is also included in the burial register sixteen days later, on 26th April, 1558. His is the second name on the list. The first is that of Richard Andrewes, also a son of Thomas, who was buried 18th April, 1558. It seems that Thomas Andrewes and his wife had two children who were buried in St Andrew’s churchyard within eight days of each other, joining countless hundreds of others who died without any record of their deaths…or lives. Alice Andrewes was buried on 24th February, 1565, and she is likely to have been the mother of the two brothers. This cannot be confirmed because the name of the mother was not included on the St Andrew’s baptismal register until 1637 – only the father. (There is one exception to this, the name “Alice Payne alias Tayler” is given as the mother of Anne, who was baptised on 5th August 1579. No father is named, and the listing concludes with the single word “baseborn”. The following year the name Alice appears again, this time as “Alice Hatcher” who is the mother of two boys, John and Thomas, who were baptised on 20th May, 1580. Presumably twins, they are also both listed as “baseborn”). Thomas Andrewes and his wife did, however, have children who survived their early years. Born before the first baptismal register, three daughters are recorded as having been married at St Andrew’s: Alice (1569), Joane (1571) and Elizabeth (1578). The marriage register does not start until 1559 with the wedding of John Smyth to Agnes Lothiar on 10th June. The name Agnes appears again on 23rd November, 1568, but this time on the baptismal register. The father’s name is William, but the mother’s name is not listed. It’s a reasonable assumption that Agnes is the daughter of Agnes and John Smyth, who is now listed under a different forename. Four days later, 27th November, 1568, Agnes Smyth was buried. This was the child rather than the mother, as William Smyth is listed as the father of another child, John (baptised 7th June, 1578), whose mother must have been Agnes. Over the centuries, parish registers became more detailed. The father’s occupation, for example, was included on the baptismal records and the child’s date of birth. The burial records would include the age of the deceased and, if they had not lived in Ferring, the place they came from. Sometimes further details were included, such as how they died. For example: the register for 1861 lists Frances Miles, aged 14, “from Goring. Burnt to death in service.” Occasionally there would be a date in the burial register, but no name, only a brief note such as: “A traveller all unknown (1814; “Male found drowned by Watch house Gate, Ferring on the beach (1851); “Found dead in field at East Ferring” (1893). By the end of the 19th century, marriage records would include the age and occupation of the bride and groom, as well as the names of their fathers – but, as with baptismal records three hundred years earlier, their mothers were not listed. “S.S.” and “Fredericus” only wrote about the memorials within St Andrew’s itself, but it was unlikely that there were many gravestones in the churchyard at this time. Many graves would be unmarked, others might have a simple wooden cross, which would soon rot away. Gravestones were expensive, while the wealthy were likely to be buried inside the church – with a memorial protected from the elements. During the 19th century, headstones became much more common throughout the country and at St Andrew’s the local gentry began to be buried in the churchyard instead of the church, in tombs to match their status. The first record of some of these memorials was made towards the end of the century. On 29th May 1893, Edwin Hadlow Wise Dunkin, Fellow of the Society of Antiquaries, arrived in Ferring with his notebook. E.W. Dunkin (1849-1915) visited hundreds of churches in Sussex and Kent, meticulously transcribing details of their monuments and memorials, copying diocesan and parish registers, writing articles about the clergy, genealogy, church and manorial history. After his death, 221 volumes of his work went to the British Museum, and more material is held by the Sussex Archaeological Society. Dunkin recorded full details of every memorial within St Andrew’s itself, filling ten pages of his notebook. He then adds three pages which he calls “In the Churchyard (selection only)” in which he details a dozen graves. Half of these belonged to the Olliver family, who owned both East Kingston House and West Kingston House, the latter once being a manor house – which is presumably why Dunkin was so interested in the family. His notebooks contain the only record of one headstone, which from his description must already have fallen when he copied its details: “Here Lyeth the Body of Elizabeth ye Daughter of William and Mary Olliver who died ye 10th of January 1735. (rest covered with turf).” There is no longer any trace of this, but three nearby memorials are still in place. The first is one of the oldest in the churchyard: Jane Olliver, buried in January 1729; and the others are William Olliver, buried April 1745, and his wife Mary Olliver, buried November 1773. Henry Dixon’s burial is listed in the register as 11th November, 1870. His age is given as 72, and the entry also includes “Vicar of Ferring for 58 years” – which is clearly wrong. (He was 34 when his ministry began in 1832, and it lasted until his death.) The error must have occurred when the original records were transcribed, and there are undoubtedly more errors in the listings – as is inevitable when copying thousands of handwritten entries spanning more than four centuries. It is likely that E.W. Dunkin chose to include the Dixons’ grave in his notes because of his interest in clerical history. Without that, and without the last part of the headstone, there would be no proof of where Henry Dixon was buried. Two of his predecessors are interred within St Andrew’s itself (William Albright and James Penfold, see above), but the parish register between 1562 and 1716 lists five others. Precisely where they were buried, within the church or in the graveyard, will never be known – just like so many generations of their parishioners. Saturday, 28th June 1986 was “a beautifully hot day” when nine members of Sussex Family History Group arrived in Ferring to carry out the first ever complete survey of the churchyard. After a few more hours on Sunday, they had copied the details from 375 graves. The oldest was the “pirate’s grave” of William Anscomb, with its skull and crossbones symbol of mortality, from 1718. The most recent was a burial in the mid-1980s. A map was drawn, and every grave was assigned a number. St Andrew’s has its own map, with a different numbering system, and this also shows the location of many unmarked graves – and it is remarkable how many of these there are, even into the second half of the 20th century. The church map, however, does not go back far enough to cover the 18th and 19th centuries. In 1992, the notes made that weekend in 1986 were updated and transcribed by Frank Leeson, Fellow of the Society of Genealogists, editor of The Genealogists’ Magazine 1972-2000 – and one of the founders of Ferring History Group. Frank also relied on E.W. Dunkin’s papers to record all the memorials within the church itself, using TheTopographer from 1790 to add details lost since then. Since then, some headstones have fallen and become overgrown or been removed. But there have also been a number of new stones put in place, some where there was no memorial before, others replacing damaged stones or marking new burials. The total number of memorials in the churchyard is still approximately 375, plus about 400 marked cremation plots (and 100 unmarked). Over the years, various mistakes in the 1986/1992 list have come to light. Names or dates may have been copied incorrectly. Memorials described as “missing” are sometimes in a different row, while the location of others has been incorrectly listed. Occasionally, even a “new” headstone has has been found, one previously covered by earth or hidden by undergrowth. A few years ago a stone “In memory of Edward Birt who died at St Ann’s Jamaica, 1840” was discovered. The memorial is also for his wife, Jane, who died 2nd April, 1873. The parish register shows that they were married in St Andrew’s on 27th July, 1830. The headstone is also in remembrance of their daughter, Jane Ann, who died 18th June, 1854, aged 22. Late in 2014, two adjacent memorials were discovered during clearance work. These seem to be for two sisters (they have the same maiden name), their graves long hidden and forgotten although they died only in the 1930s. Even now, over 1250 years after its founding charter, St Andrew’s churchyard has not given up all its secrets . . . But now I rest in peace till I shall rise again. The Topographer was published in 1790 and The Gentleman’s Magazine in 1811, and it is entirely possible the author of both articles was one and the same. “S.S.” gave his address as “Little-Hampton, Suffex” while “Fredericus” began his account with the distance between Ferring and “Little Hampton”. The Topographer‘s typesetting included what was known as a long “s”, which was very similar to a small “f”. This had been used in printing wherever there was an “s” at the start of a word (unless it began with a capital) or in the middle (hence Suffex), but never at the end. By the time of The Gentleman’s Magazine, 21 years later, only the short “s” was used in print form. The origins of the long “s” lie in Latin and the Roman alphabet. At one time, when only the clergy could read, all writing was in Latin – the charters of land given to St Andrew’s, for example. As English became a written language, Roman letters were adopted. When printing began, and then when books were printed in English, the same letters were used – and the major typeface in the history of printing is still known as “roman”. With the adoption of new printing fonts at the end of the 18th century, the long “s” rapidly fell out of favour. The Times stopped its use in September 1803, for example, and very soon it was no longer found in any typesetting. Handwriting habits followed printing, and by mid-century the long “s” had all but disappeared. The only exception was the printing of clerical sermons, where it remained the preferred style until the end of the 19th century. St Andrew’s Church in the Village of Ferring — the 2017 edition of the guidebook and history, revised and updated by David Garnett, is on sale in St Andrew’s @ £3.00.